Bahá’í communal worship is distinguished by two characteristics. First, since the Bahá’í Faith has no clergy, worship can be planned and led by anyone, female or male, young or old. Second, rituals, rites, and ceremonies are forbidden, and so worship tends to be very simple. Central to worship is the use of scripture, either carefully and clearly read, sung, or in the case of scriptures in Persian and Arabic, chanted. Chanting of Bahá’í prayers in English, while not widespread, is developing. While the Bible, the Qur’an, and scriptures of other religions are occasionally used in Bahá’í worship—especially when the non-Bahá’í public is invited—generally the writings, and especially the prayers, of Baha’u’llah, the Báb, and Abdu’l-Baha are central to the program. The entire congregation does not recite a scriptural passage in unison. Generally one person reads, chants, or sings while the others listen. Such worship is best described as a meditation on and celebration of the Word of God. Another important element of Bahá’í worship is music. This may include instrumental music (except in Bahá’í Houses of Worship, where all music is acapella), listening to recorded music, or singing together. Bahá’í music as a particular musical genre does not exist; rather, music expressing Bahá’í themes has been written in many genres and styles. Music that is written to be performed in a worship context usually incorporates passages from the Bahá’í scriptures. The first American Bahá’í hymnbook was published in 1903 and contained mostly modified Protestant hymns. Soon after its publication, hymns on Bahá’í themes were composed. With the rise of radio, records, talking pictures, and other forms of popular culture, Bahá’í songs came to be written in a wider variety of genres. Guitars became a particularly important instrument for Bahá’í music, because most Bahá’í music was performed in homes or rented facilities where portable instruments were most convenient. In the 1960s and 1970s several classical pieces were written on Bahá’í themes to be performed by orchestras. More recently country music and jazz have emerged as genres for Bahá’í music. Starting in the 1980s Bahá’í youth workshops created music and skits illustrating Bahá’í themes using rap and hip-hop. Music inspired by African-American traditions has been an important genre for Bahá’í music since the 1960s; in 1992 the debut of a gospel choir at the Bahá’í World Congress made Bahá’í gospel music very popular in the United States. Always, the role of music is to uplift and inspire those gathered to worship. The Bahá’í Faith has no required weekly worship services, but it does have a regular community gathering known as a Nineteen Day Feast. Generally held on the first evening of each Bahá’í month, or once every nineteen days, the feast has three portions: worship, administrative, and socializing. It is normally open only to Bahá’ís. The worship portion of feast procedes in the same manner as devotional programs discussed above. Anyone can organize the readings and songs, even a child. At the administrative portion of the feast, the business of the Bahá’í community is discussed and necessary action taken. The feast concludes with a social portion, where all attending enjoy refreshments and socialize. A common type of Bahá’í meeting is the fireside. The “classic” fireside described by Shoghi Effendi involves a Bahá’í inviting someone to his or her home to discuss the faith in an atmosphere of service and friendship. The fireside generally has two elements: hospitality and discussion of the Bahá’í Faith with those seeking to learn about it. 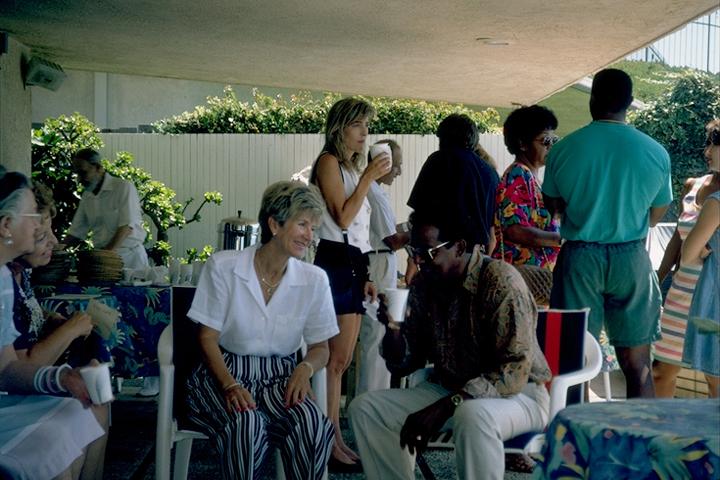 All Bahá’ís are encouraged to host such gatherings regularly. Sometimes Bahá’í communities sponsor large formal “firesides” in a home or a Bahá’í Center. These events begin with a speaker (who need not be a Bahá’í) describing an aspect of the Bahá’í Faith. This presentation is followed by questions, discussion, and refreshments. Because the Bahá’í Faith stresses personal investigation of the truth, questions and discussion are important parts of a fireside gathering. Formal firesides are nearly always open to the public. An important new focus of the Bahá’í community are the core activities: devotional meetings, children’s classes, programs for junior youth (those aged 12-14), and study circles for youth and adults. 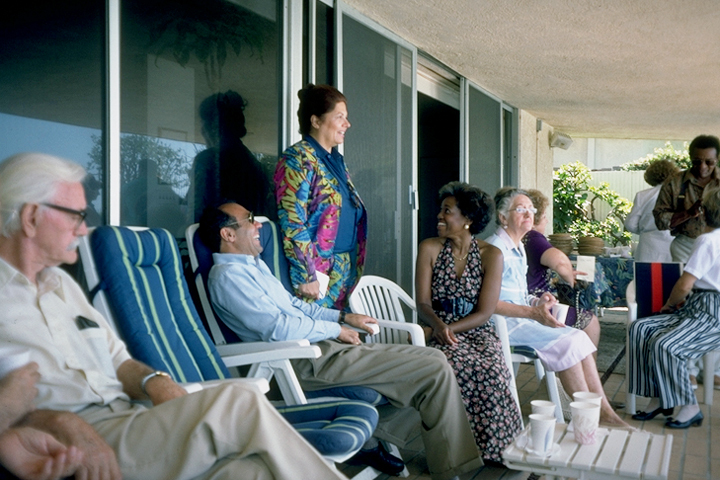 A devotional meeting is a meeting where prayers and other devotional materials (Bahá’í or not) are shared. They can be held by anyone anywhere. Bahá’ís have always held such meetings, but the emphasis on them is new. Junior youth programs focus both on classes and service projects where they assist their village, town, or city in some way. Study circles currently use the Ruhi books as their primary curriculum. Each book is studied with a tutor and requires dozens of hours to complete. Their purpose is not primarily to impart information, but to strengthen skills. Book 1 focuses on how to give devotional meetings; Book 2, how to visit people in their houses to share Bahá’í ideas and prayers; Book 3 provides materials and tips for teaching classes to children; Book 4 discusses the lives of the Báb and Bahá’u’lláh and ways to tell stories about them; Book 5 covers junior youth programs; Book 6, the teaching of the Bahá’í Faith to others; Book 7 offers training to be a Ruhi tutor; and Book 8 focuses on the Bahá’í covenant. The purpose of the books is to inspire its students to study the Bahá’í scriptures regularly, explain them to others, and engage in a series of basic activities. The purpose of the core activities is not simply to expand the Bahá’í community, but also to empower others in their lives. Gradually, efforts at social action and public discourse are being integrated with the core activities, providing a vehicle for nonviolent social change accessible to all.